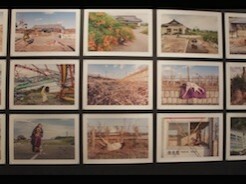 A Body in Fukushima, a series of photographs, is the collaborative work between Eiko and Japanese historian and photographer William Johnston. 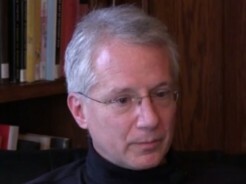 Eiko and Johnston met in 2005 and, prior to this artistic collaboration, had co-taught courses in Wesleyan University on the atomic bombings and mountaintop removal mining. Eiko first conceived photo project A Body in Fukushima as a part of her fist solo project A Body in Places, which began with 12 hour-durational performances of A Body in Station at 30th Street Amtrak train station in Philadelphia in October 2014. To make a strong contrast to this majestic and busy Philadelphia station, Eiko thought about going to Fukushima she had previously visited alone in 2011 soon after earthquake, tsunami and nuclear meltdowns hit the area. She invited Johnston to collaborate. In 2014, Eiko and Johnston made two extended visits to the irradiated areas surrounding the Fukushima Daiichi nuclear reactors, where all residents had been evacuated. Only shortly before their visit in January, had people been allowed to visit these radiation-damaged areas, where access was limited to daylight hours only. Following the abandoned train lines, Eiko and Johnston visited the empty stations and their neighborhoods, places that formerly bustled with life and people. 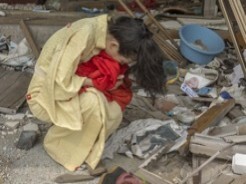 Over three years since the initial disaster occurred, the buildings hit by the tsunami remained in their damaged state. Those that survived without damage sat in a no-man’s land due to the radiation. Vines have grown covering the rusted tracks. 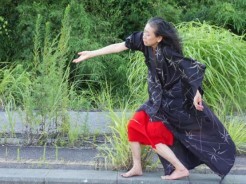 In these locations, Eiko embodies bitter grief, anger and remorse, sometimes in vulnerable gestures and at other times dancing fiercely. They returned to the area again in the 2016 and 2017 summer and found much of the places they had visited in 2014 have been radically changed. New sea walls have been built, and many workers have been brought in to clear houses and buildings. They decontaminate the fields and roads. Fukushima has become a very dusty and busy place though people have not returned to live there. Only places that are left untouched by bulldozers are shrines and forrest. Eiko danced in these places that remain highly irradiated. In all, the photographs by Johnston capture Eiko’s movements and gestures as well as the evolving landscape over their four visits. The exhibition has accompanied the tour of Eiko's solo performances,. 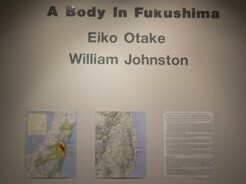 The exhibition includes video A Body in Fukushima Eiko created using only Johnston's photographs. 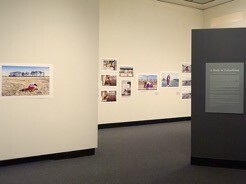 The Pennsylvania Academy of the Fine Arts in Philadelphia (Oct. 3, 2014 through April 5 2015). Three galleries in Wesleyan University, Middletown, CT (Feb. 5- May 25, 2015). Danspace Project Platform 2016, which focused on Eiko's A Body in Places, included 24 hour Fukushima photo exhibition with video of A Body in Fukushima in the sanctuary of St Mark's Church in East Village New York. 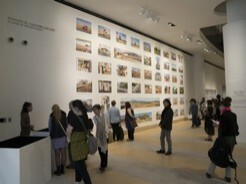 Scholars and artists gathered for three roundtable discussions in prior to the opening of the exhibition. Eiko designed the shifting light and 24 artists performed at every hour at the hour joining in the commemoration of the fifth year anniversary of the Fukushima disaster. On March 11, 2017, the exhibition at the Cathedral of St Jon the Divine closed with another memorial, a four hour event, Remembering Fukushima that included performances and installations by various artists. In addition,the video of A Body in Fukushima Eiko edited was shown in Brussel, Belgium, Hong Kong, Australia, Frankfurt, Germany, Philadelphia Fukushima, Japan, Martha's Vineyard, Durham, NC, and the Cathedral of St.Jon the Divine. After their fourth trip to Fukushima in 2017, Eiko edited the seven and a half hour video from all of their visits to Fukushima. On three Sundays in November 2017, Eiko performed A Body in Places: Met's Edition all day at each of the three Metropolitan Museums, the Cloisters, the Breuer, and the Fifth Avenue Building while projecting these video. In February, 2018, Johnston and Eiko created another gallery show titled A Body in Fukushima: Recent works for the South Gallery of the Center for the Arts in Wesleyan University. This exhibition included three large size photos from their 2017 trip to Fukushima, a 65 min video Eiko re-edited consisting of Fukushima photos taken during their 2017 visit to Fukushima and selected still photographies of Eiko's performances at the Metropolitan Museum in New York City. The project was made possible in part by funds from the Japan Foundation through the Performing Arts JAPAN program, the National Dance Project of the New England Foundation for the Arts, and Wesleyan University. 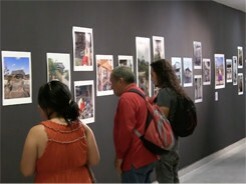 The photography exhibition, A Body in Fukushima was co-commissioned by Pennsylvania Academy of the Fine Art, Galleries of Contemporary Arts of University of Colorado at Colorado Springs, and Wesleyan University. Eiko is a Doris Duke Performing Artist Fellow.